Creative portrait and brand photographer. Previous How creating art helps you grieve. I went to Ireland by myself and didn’t die! Traveling solo has been a goal of mine for some time now. It is the ultimate “I do whatever I want” and such a confidence booster. 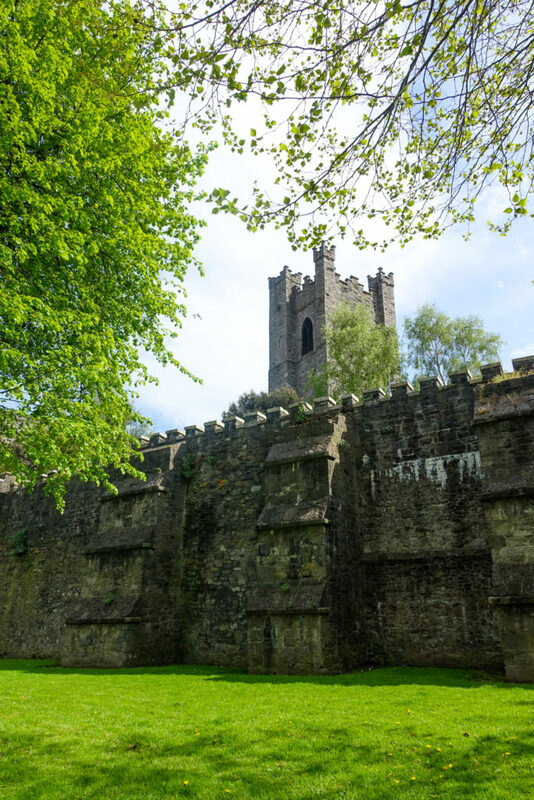 I finally got the chance when I traveled to Dublin, Ireland in early May. To be honest, I was nervous the last few days leading up to it and I got off the plane, caught my bus, and thought to myself “WHY do I have to be so independent?! ?” I figured it out though and now I am so happy that I went! 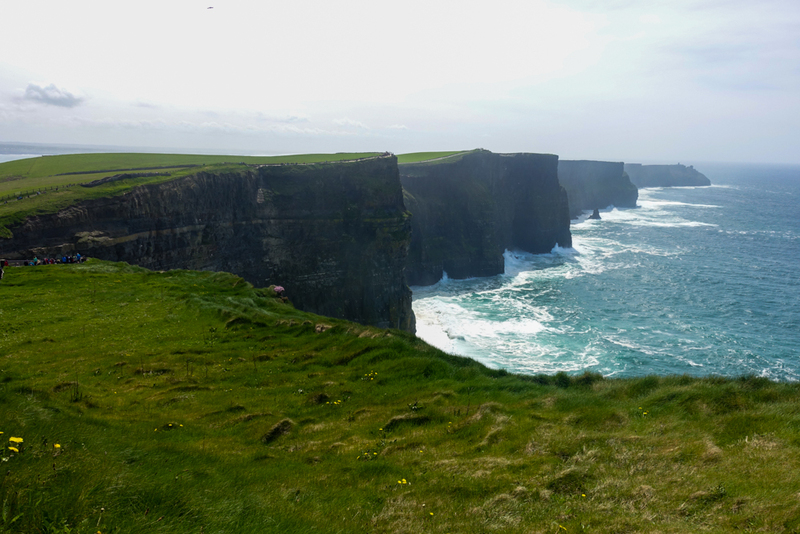 Here is a day by day and what I learned by visiting Ireland and traveling solo for the first time! 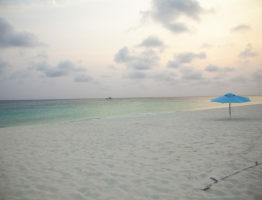 For those you that don’t want to read the thing, here is an online gallery of the images I took! It goes without saying that when you travel alone, that means you are the only one you have to pack stuff. Make sure that you have enough room for everything and also enough extra space for goodies you want to bring back! If you plan on just bringing carry-on baggage, remember that only you will be lugging it around airports and public transit! I booked an AirBnb in Dublin and my host was amazing. I would 100% recommend Claire if you are a solo woman traveling to Dublin. I decided to go with a private, woman only room for my first solo trip. I felt super safe and she even had candy, breakfast, and suggestions on what to do around town! Day One: I haven’t slept but I have to stay up. DUBLIN. The flight itself wasn’t bad at all! 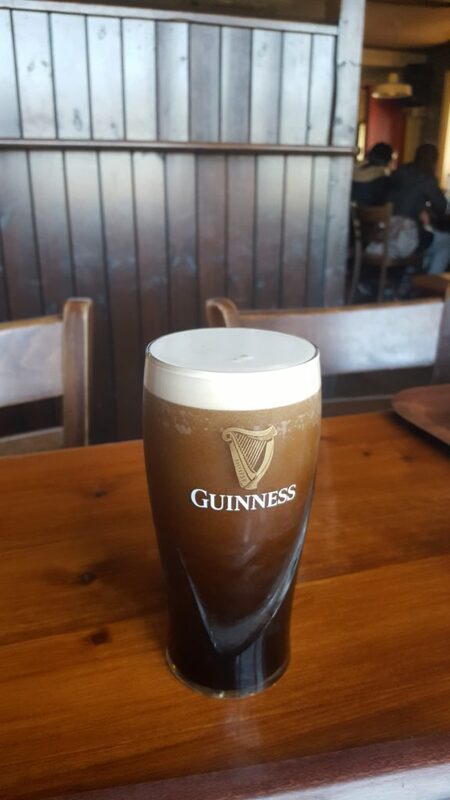 I had a layover in Iceland and got to Dublin Airport at 10am local time. The first day of international flights is always the toughest since all I want to do is nap and you can’t or your sleeping schedule will be screwed. My check-in time for my AirBnb wasn’t until 7pm, so I found a Bed & Breakfast that will store your bags for the day for only 5 Euro! This place was also close to Heuston station, where I happened to be meeting my host. Perfect! I spent most of the day walking around and got some food. Also, recommend not waiting to that last minute so you don’t settle on pretty bad Mexican since it is the first thing you see. Sorry Dubliners, wasn’t too impressed…but then again, it IS pretty far from Mexico. It was really awesome to walk around and see what the city was like. 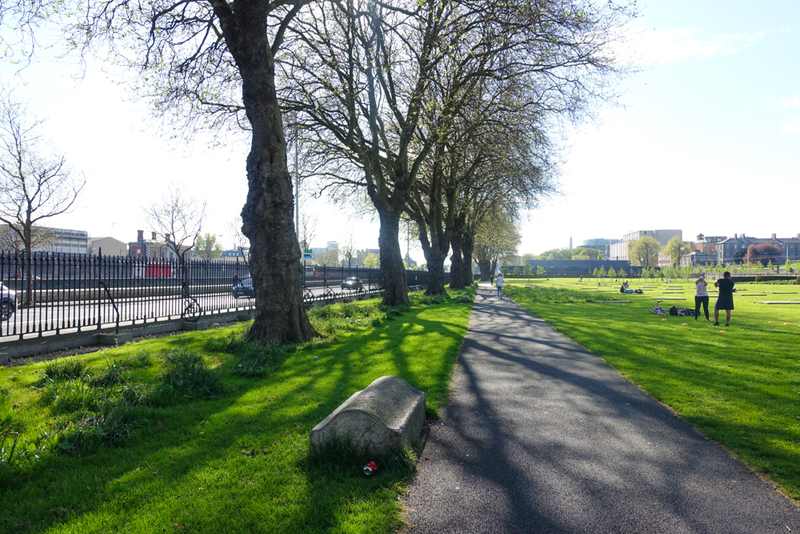 I love that there is so much green in Dublin, even in the city. Everywhere I walked there were little parks with ponds or giant trees or random castles in the middle of downtown. 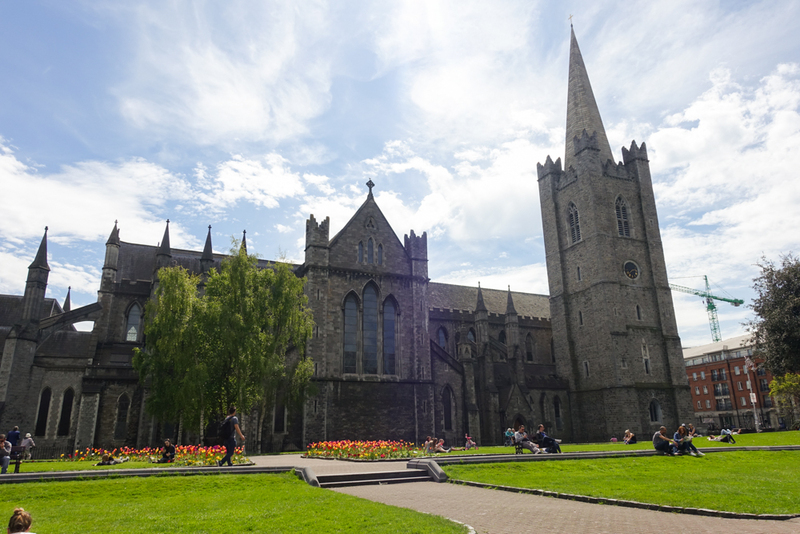 One of my favorite things that I did that day was, on a whim, decide to walk to St. Patrick’s Cathedral. That place is amazing…the huge green space where everyone was hanging out, reading, walking their dogs and just chilling in the shade. I definitely almost fell asleep! I took some photos and wandered inside. It does cost about 7 Euro to tour the inside, but it is worth it. Not only is it gorgeous but the price helps keep it open. I concluded my day with more walking around, snacks, and finally, BED. Ah yes, I’ve slept 12 hours…but somehow still tired, BUT I’M IN IRELAND! Today was my serious history day and my first tour. Another quick tip, make sure you have PLENTY of time to get to your tour. Unfortunately, I was that person and was about 10 min late, because I got on the bus….and didn’t realize that my stop’s name was announced in Gaelic and missed it. I had to get off that bus and onto another one (nice guy let me ride for free) and barely made it before they left. I am so happy they waited. Get biweekly inspiration and a FREE ebook! 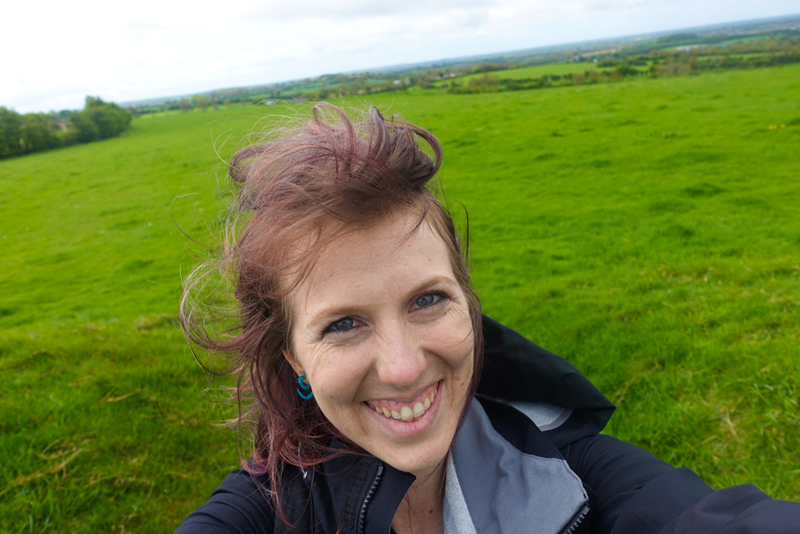 Here is the tour that I took to the Hill of Tara and Newgrange. 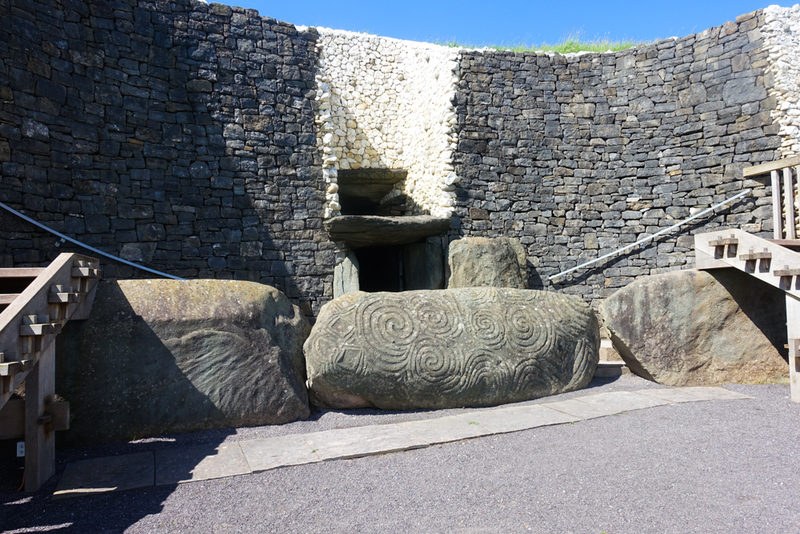 This tour was 40 Euro and included entrance to Newgrange and bus ride to all the places. The tour was super informational and went through so much history. 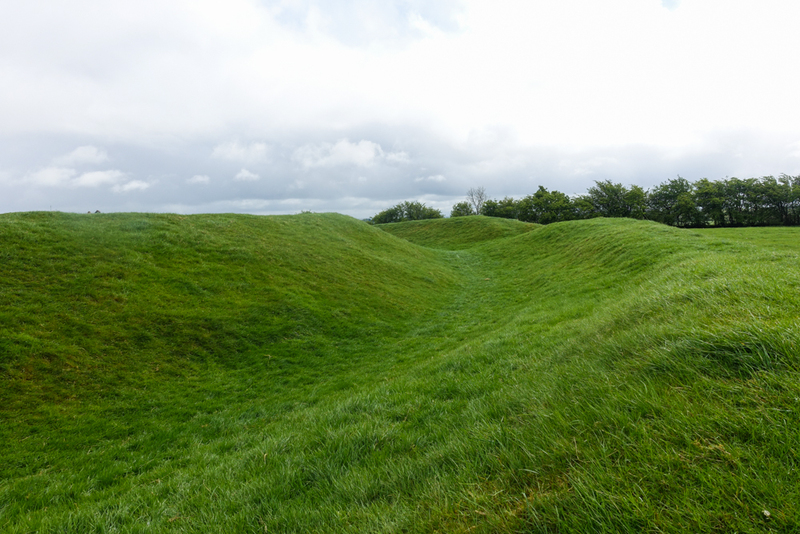 The Hill of Tara has been in use by people from the Neolithic era and even has stories of Tara being a place of kings. Tara was our first stop, and even though it rained a bit and was insanely windy, it was so amazing to see so many rolling, green hills and think of a place that had such spiritual and cultural significance to people so long ago. 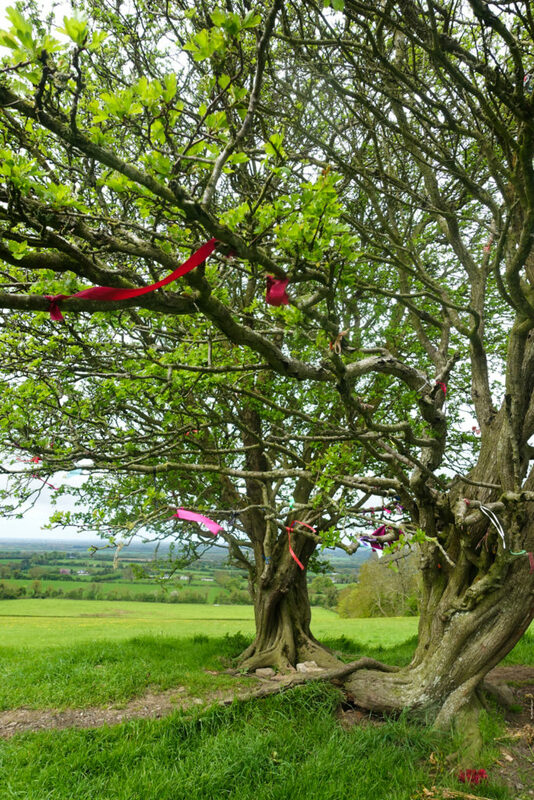 While I was wondering around in Tara, I stumbled across a tree that I was later to find out was a fairy tree. Fairy trees and all things fairies are taken very seriously in Ireland. 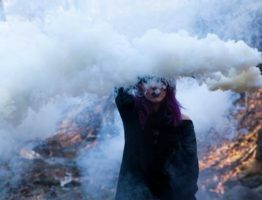 I heard stories of huge businesses refusing to develop where a fairy tree was since it is believed that a deadly curse would be placed on themselves and their family would be decimated. Fairy trees are places of magic. People from all around travel to the trees and leave objects from children’s toys to fabric ripped from the clothing that they are wearing, to bring good fortune. Here is a good article on fairy trees if you would like to read more. From the Hill of Tara, we headed to a small farm along the way for lunch. I will be honest, vegan options were not really a thing. I did get to have some bread and veggie soup and I was glad that I had brought snacks for myself. However, the really awesome thing about taking less time to eat than the others is that I had time to wander around the farm (they gave us permission!) I got to pet baby lamb, cows, goats, and bunnies! They also had an amazing selection of chickens, roosters, and a turkey that took my purple hair as a challenge and tried to chase me away! From the farm we were off to Newgrange! 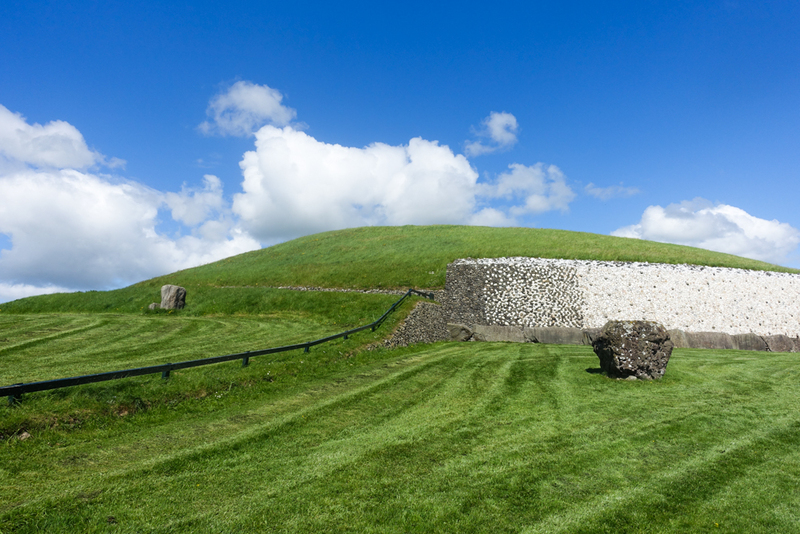 As for some background on Newgrange, the site was built over 5,000 years ago. That’s so many years! The people that created this structure didn’t have things such as the wheel, and they figured out how to bring these rocks and set each one with immense precision. 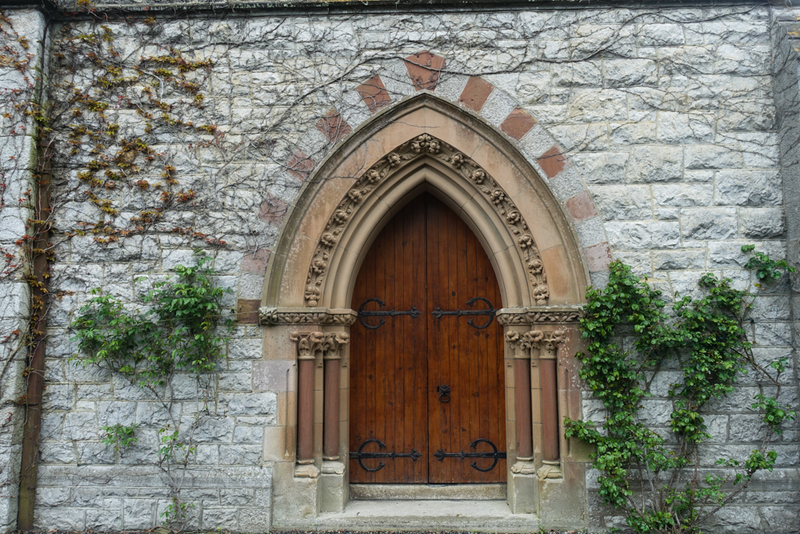 Every stone has a purpose and holds the other stones in place, without the use of mortar. During the Winter Solstice, the sunrise lines up perfectly with the entrance of Newgrange, illuminating the chamber. There is speculation on why they may have done this but you can enter to win tickets to see it every year. I did! I think it would be an excellent excuse to make it back. Due to preservation efforts, I was able to go inside but unable to take any photos. The passage was beautiful and I would highly recommend it if you don’t mind enclosed spaces. Being able to see all the spirals and stone carvings up close was something seriously special. For those who know me know me, you know that I love food. This is my happy place. The only thing I was sad that I didn’t bring to Ireland, was my yoga clothes. 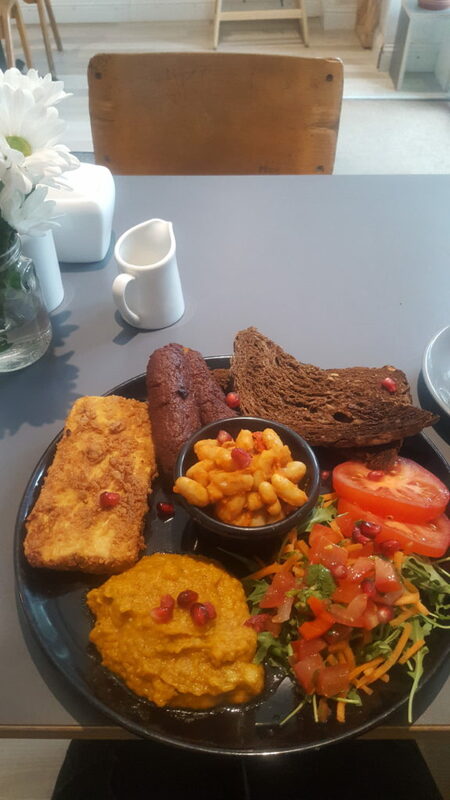 This restaurant, Happy Food not only has amazing vegan food but is also a yoga studio. Next time! 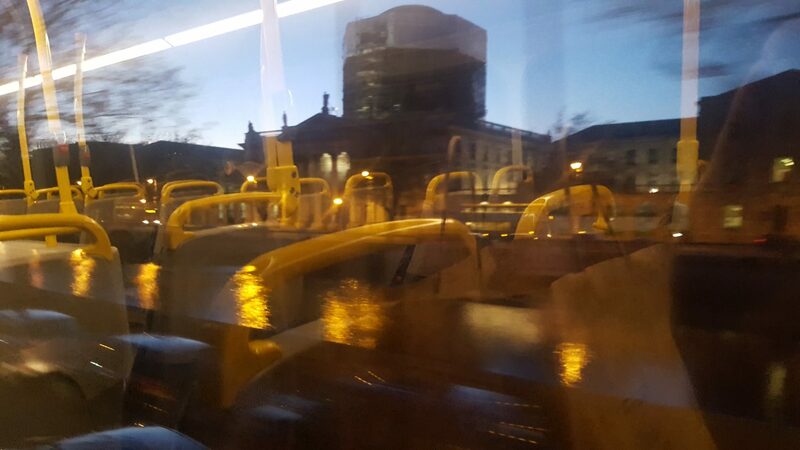 Dublin has a really awesome rail system, called the DART that will take you to the towns around Dublin as far as the West coast. It is a really affordable and easy way to see parts of Ireland you normally couldn’t without renting a car. 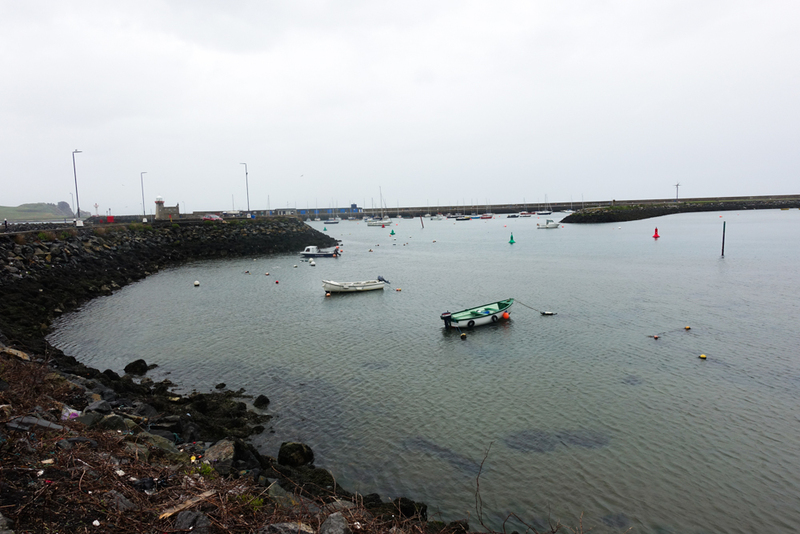 I decided to take the 30 min train ride from Connolly Station to Howth, only about 4 Euro. 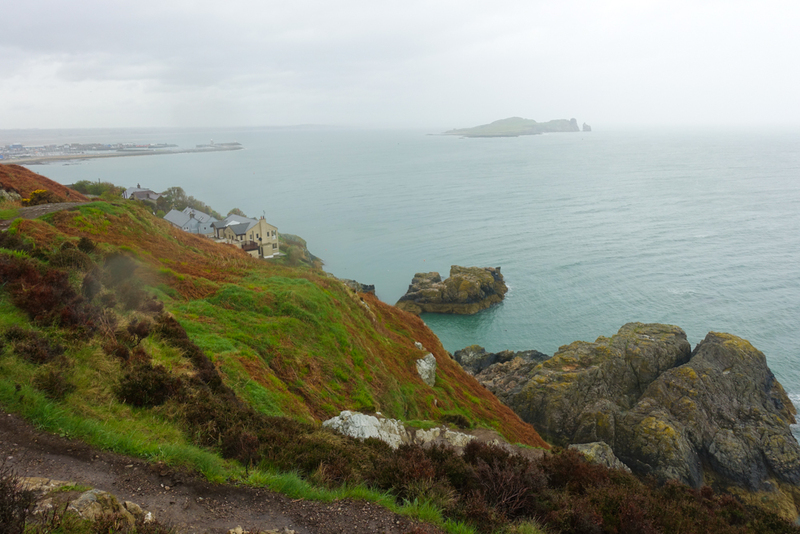 Howth is seriously one of my favorite places I visited when I was in Ireland. 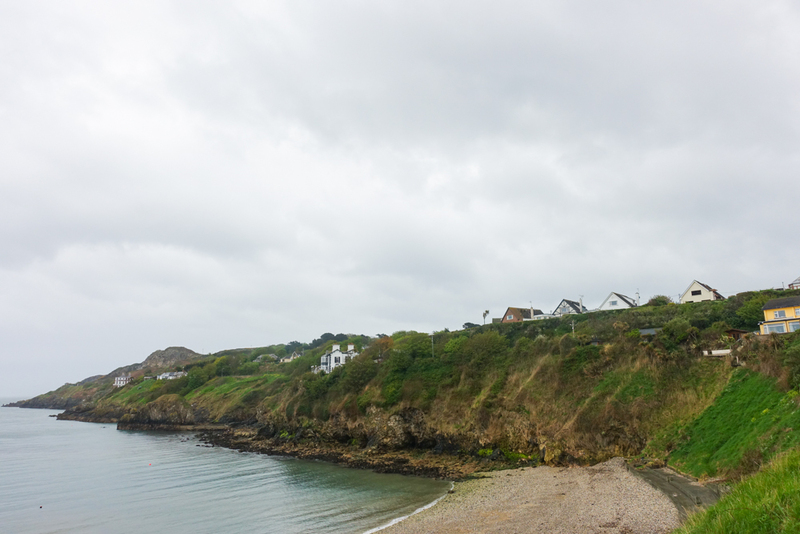 Howth is a seaside town with a gorgeous cliff hike, a castle, and a gorgeous church. The people were super nice and you can get really good food and drinks along the pier. It was raining all day, but it was warm and honestly, it rains every day in Ireland! Make sure to bring a good raincoat when visiting Ireland, for sure! One of my favorite things about the Irish is that they won’t let the weather get them down. 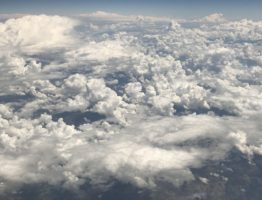 They will be the first ones to tell you “We don’t talk about the weather here.” It will rain…it rains every day at some point and to some degree, but you can’t let that stop you! I even found a house that I am basically commandeering 😉 but really, whoever you are, please give me your house. One of my favorite things about traveling by myself is the freedom to just go with your impulses. 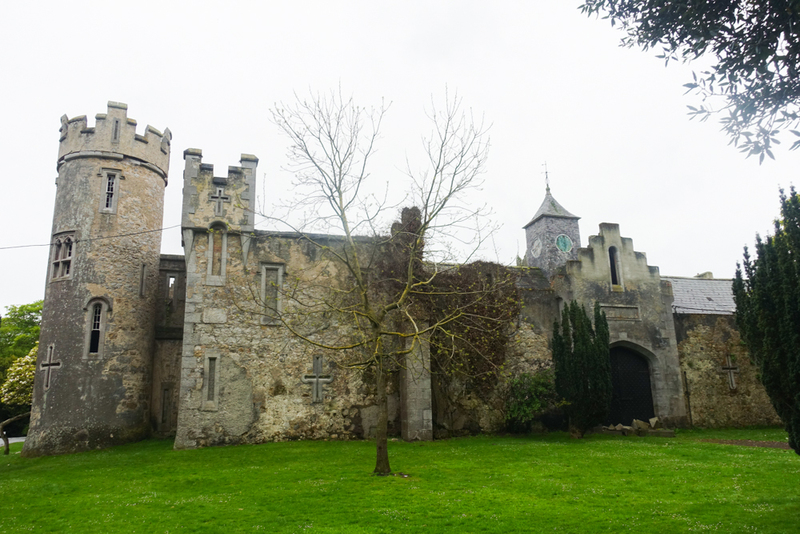 After doing the cliff hike, I went to visit the Howth castle and decided to detour and ended up stumbling across a beautiful church. and then onto the castle! Would you believe a family lives here? 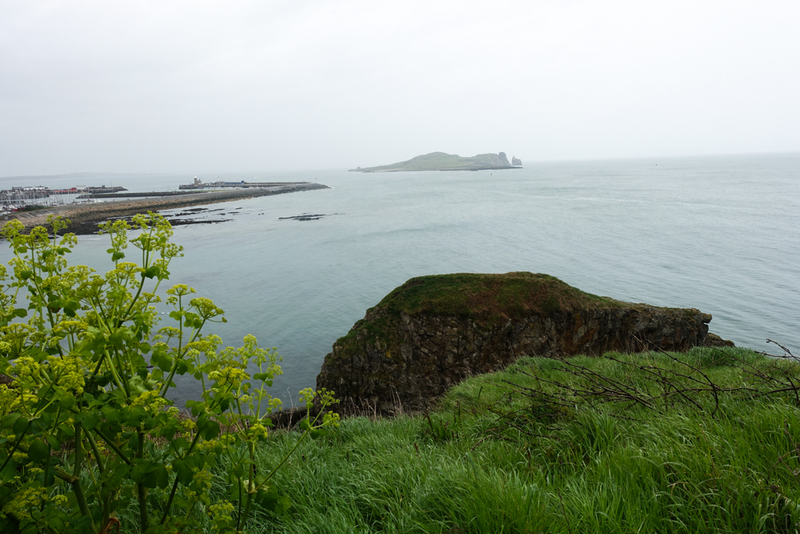 I am going to leave my day at Howth there, because honestly, I can post forever and I still have more to tell you! Now, I am certainly someone who likes doing the lesser known attractions but sometimes things are big attractions because they are awesome. If you are in Ireland…Go. to. the cliffs. Just go. It was so beautiful to sit on the edge of the country and look out. I was hypnotized by the waves hitting the side and how green all the moss was. I took an insane amount of images. 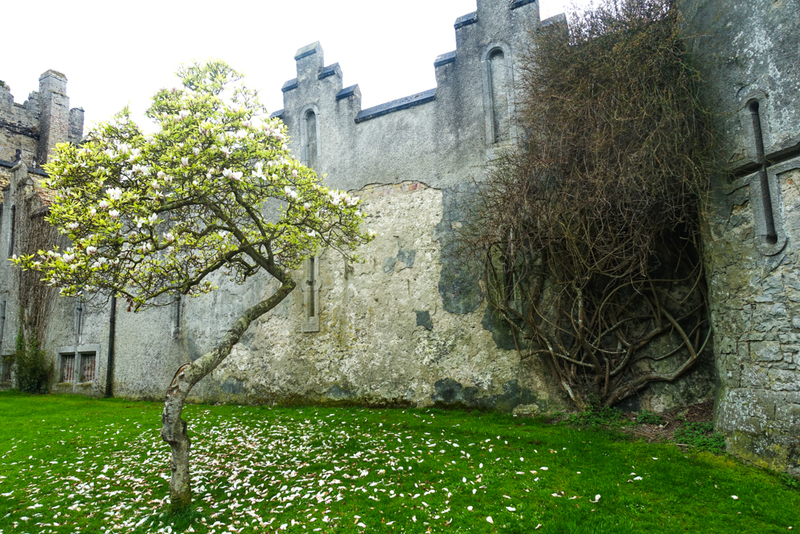 I will only post a couple here, but for the sake of space, you can see them all in this gallery: Ireland photo gallery. 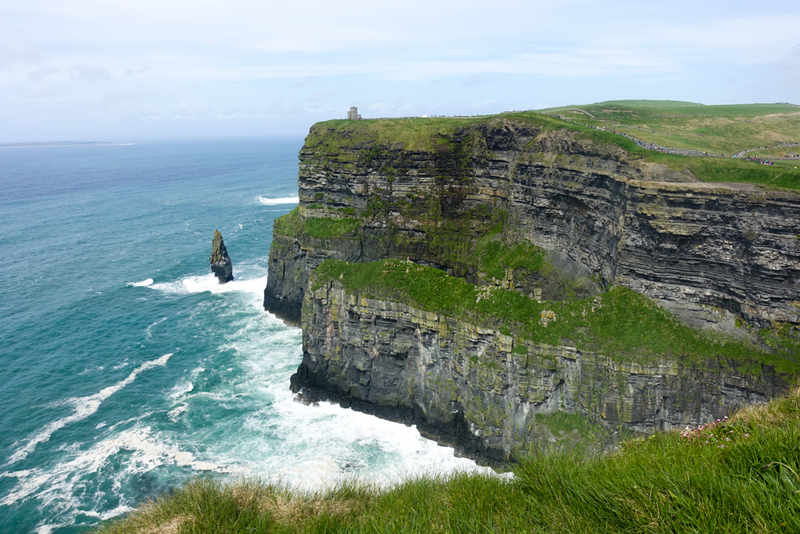 I took a tour with Paddywagon tours from Dublin to the Cliffs. It was so so worth it. They drive you through Galaway and have plenty of stops where you can have a break, get some coffee, lunch and a Guinness! Just remember you might have to chug that Guinness in 20 min! The guides were super helpful so I would highly recommend the tour. I will say that Guinness doesn’t necessarily “taste” different, but the texture is a-maze-ing…seriously. So creamy and delicious. I was quite happy once I downed it before the tour took off again. 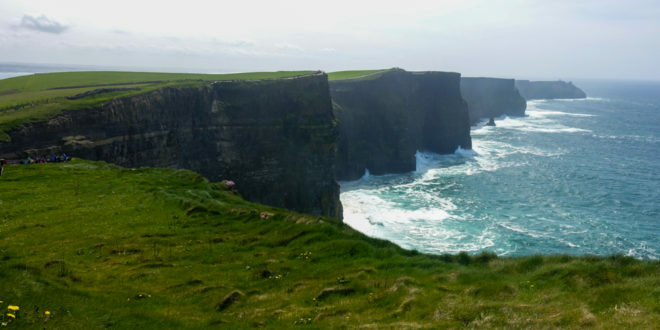 It goes without saying that the Cliffs were beautiful…but they were seriously majestic AF. Even with it being a touristy area, I found it so peaceful. I would highly recommend going on a weekday like I did as the crowds are well-known and my favorite parts was being able to walk closely to the edge and listen to the waves. At this time in my trip I had already gotten over looking like a weirdo. 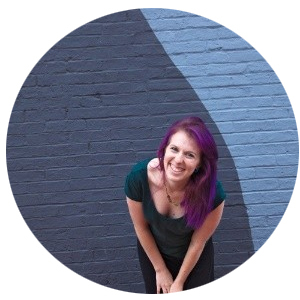 I mean, I normally don’t care when I am in the states, but when traveling by myself abroad I was trying my best to fit in…but then again, I DO have purple hair. 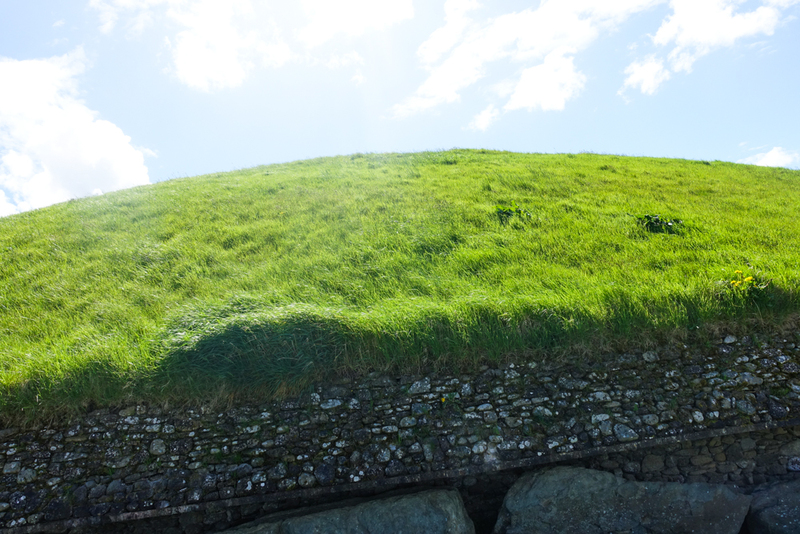 When I was at Newgrange I had the impulse to meditate, but I didn’t. 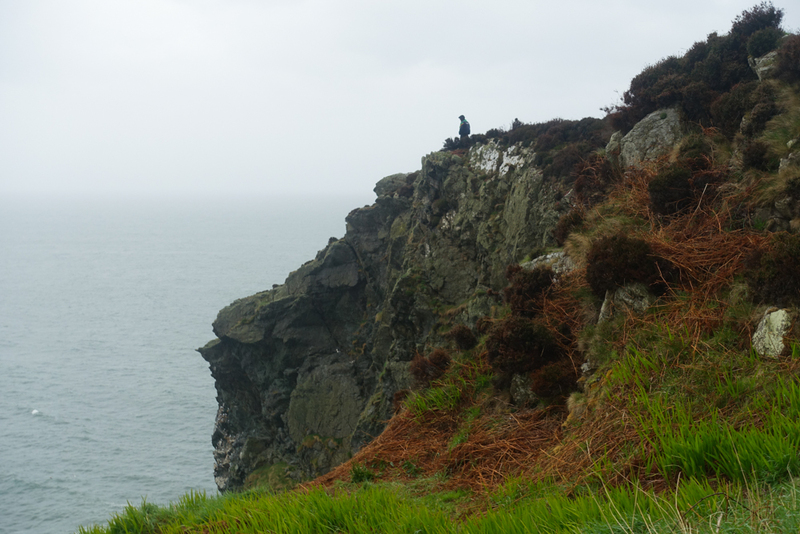 This time, I took it and walked up to the very tip of the cliffs and meditated. There is something about seeing something so massive and old that it reminds you of everyone’s part in the world. 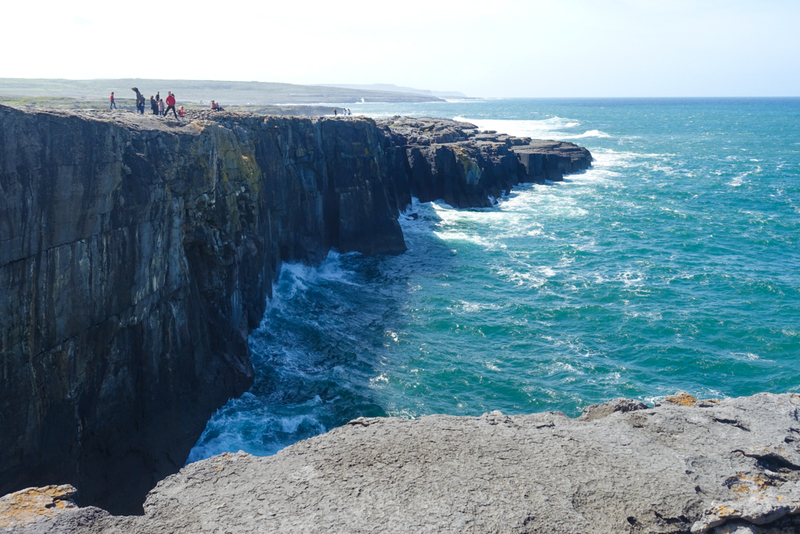 I felt small and big, like the cliffs and like the waves. It was a pretty perfect day. There did come a time where I had to detach from meditating and then wander back to the tour bus. I wandered into a few of the shops there (not surprisingly they super duper overcharge) and even got to hear a guy playing an accordion. I decided to buy tickets for the Hop On Hop Off Tour around Dublin. Basically, what people usually do their first day to get an understanding of the city haha. However, it was a good way for me to easily get from place to place and see the things I hadn’t had time to. A friend that I met at a metal show in Baltimore moved to Dublin for school. Even though she is working on her thesis she took some time to meet with me at Trinity College and walk me around the Library and grounds! I seriously want to live in this library. Here they house the Celtic Harp, which is the symbol on the back of the euro and oldest harp in Ireland. 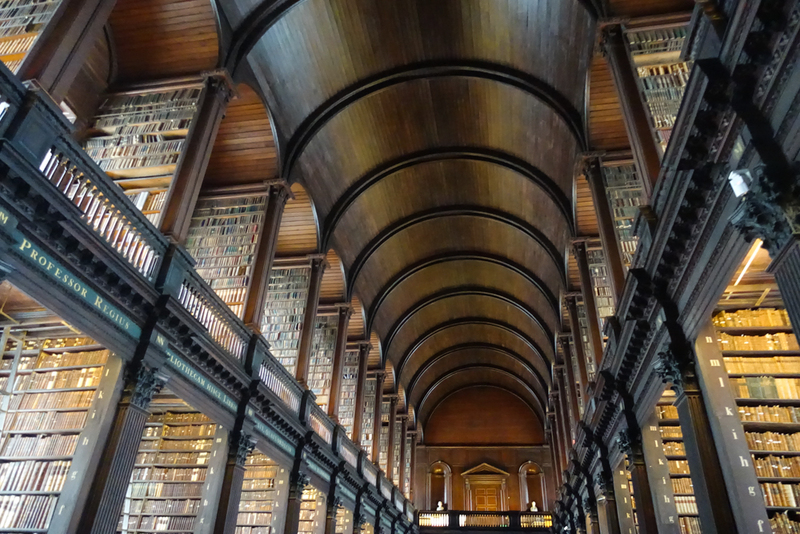 I also took a look at The Book of Kells, but it was pretty busy and hard to get more than a few seconds to take a look. My favorite part had to have my friend telling me stories about the college and showing me around…oh and her scaring the tourists by playing with a sculpture on the grounds. After talking a bit about life at Trinity and grabbing a quick lunch, she had to go back to working on her thesis and I walked down to the National Gallery of Ireland. I finally got to see a Degas and yes, it was about what I expected. However, my favorite part of the museum was seeing the Irish art and how their history shaped the art that was produced during that time. It is easy to think that you have learned everything there is to know about art history when you go to Art school, but there is so so much more to see and experience! 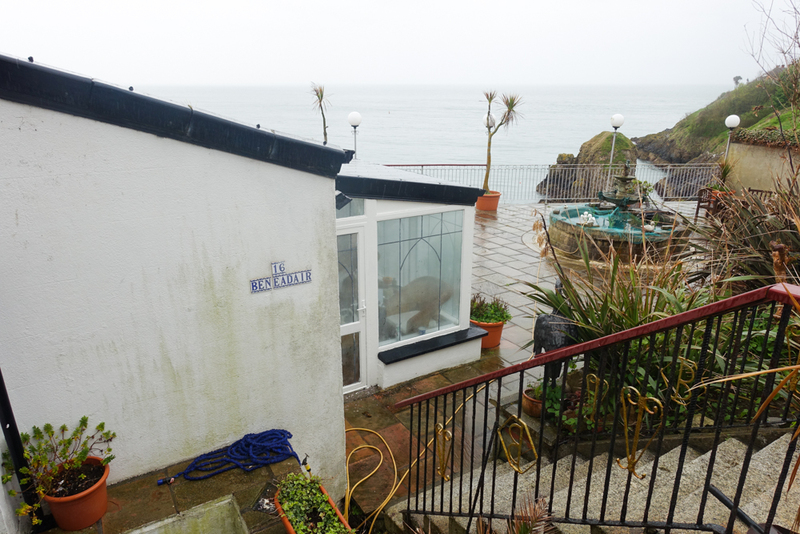 At this point, it is raining but like the Irish, I am not going to let that dampen my plans of exploring my last day. 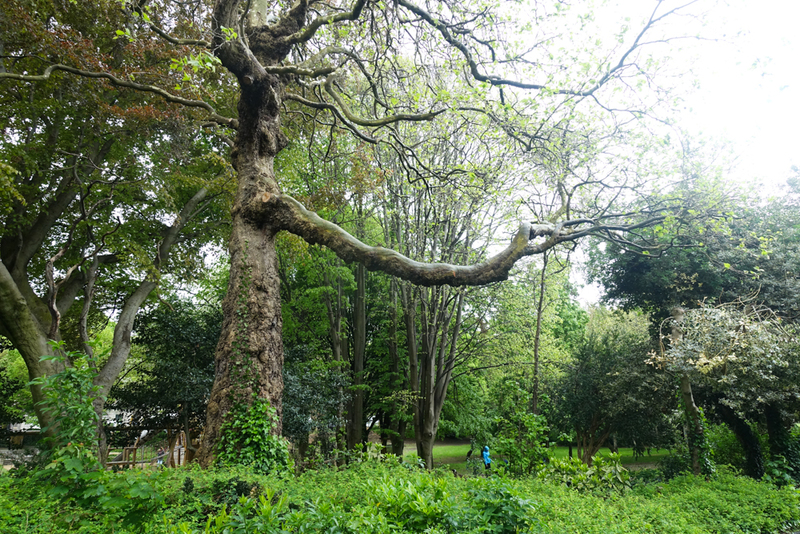 I took a walk through Merrion Square park and just love that there are such huge patches of green throughout the entire city. I wasn’t able to get really good images, but here is the wiki for some images of the Irish bog bodies if you are interested. Back in the time of kings, if the season’s crop did not yield then it was thought to be because the king was unfit to rule. Oftentimes, the king would be killed and then tossed into the bog as an offering to the gods and to return their favor. The unique ecosystem of the bog preserved the body and the museum had them on display. SO. COOL. After wandering around for a good hour or so, I was pretty tired annnd hungry. I went back to a favorite vegan restaurant, Cornucopia and proceeded to order way too much food and then follow it up with not just one, but TWO desserts..and YES, I also got wine. It was a really good end to my trip. A guy played guitar while I sat at the bar by the window so I could watch people as they hurried to their Friday night dinner or event. Traveling alone gave me space to really just be and experience things as they are. I was not worried about another person, but just doing exactly what I wanted in that moment. From the plane flight over to the flight back, I met all kinds of people from lawyers from Berlin to a couple visiting from Boston! My last day was exhausting but also fed me and my soul. I couldn’t stop watching, interacting, and walking along the streets of Dublin. The energy is contagious. Nothing can feed your confidence like walking in another country with no fear. Feeling my boots on the streets of a city that I may or may not set foot in again was incredibly freeing. At some point I had to say it’s time for bed and as I walked to the bus stop, as the sun was going down I had a guy approach me asking me if I thought Dubliners knew about something….a program he was promoting. I looked at him confused and he asked if I was from Dublin. I smiled at thinking that he thought I was a local. Seems like I was doing pretty good! After talking to him a bit it turns out that he is actually from a neighborhood in Baltimore right down the street from my current apartment. Insane! I headed home afterwards with a full heart and sore feet. The view outside the bus window on my last day in Dublin. For any of you that are on the verge of traveling alone but have not made the jump, do it. There is nothing like it. Your first day or two you may feel nervous or like you don’t know what you are doing. I was very stressed my first day but once it clicked, I was stomping around the city and it felt oh-so-amazing. You are so connected to the present moment. You can choose to go for a walk and take a detour on a whim. People will talk to you! You will have conversations with people you will develop friendships with after or never see again. It is an amazing feeling, and, honestly, I feel kinda like a badass having done it. Make sure to check out the rest of the images via the online gallery here! Have you ever traveled alone? I would love to hear your stories! What I learned this year and what made a difference. My name is Ronni Fordham and I am a good friend of your mom. 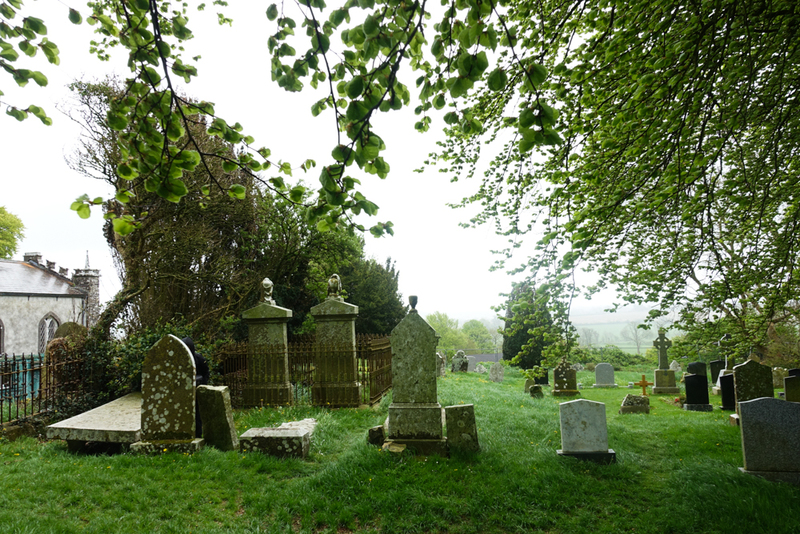 I read your article on Ireland and I was amazed at the depth and spirituality of your writing. I have always wanted to visit Ireland, but my husband doesn’t favor going. Your article drew me in and gave me a good sense of what it would have been like if I had visited. Hello Ronni! Thank you so much for your kind words. I love to travel and would love to share more as time goes on. <3 I am glad I am able to give you a taste of what Ireland is like. Art Making as Self Care eBook!